Wow oh my gosh it has been a while since I have blogged... the truth is November has been insane and we spent the larger part of it outside searching for snow and enjoying the mountains. Which is what today's post is all about just a few of my favorite winter essentials. I feel like dressing in the winter especially in Colorado is always tricky because some days it is hot and then other days you are walking through blowing snow and battling freezing winds. The truth is it would probably be easier to hide out inside all winter but who really wants to do that? SO I have a few essentials for adventuring outdoors this winter. These essentials are all from Athleta and that is because this is a sponsored post by Athleta BUT I have to tell you I put these products to the test... like freezing weather for hours test and they held up! I was beyond impressed and so please please please keep reading! Okay so if you couldn't tell by the photos my plan this winter is to baby wear as much as possible because one it keeps my hands free but for two it keeps Ophelia warm which is essential for me this winter. One of my best finds to make this happen is the Cascades Parka from Athleta. This coat is warm.. like crazy warm AND because I sized up it fits not just around me but Ophelia as well in the baby carrier. Even though I sized up it fit great and you could really tell the coat was well made and was designed for warmth and longevity. I will hopefully use this parka for years to come and I am incredibly excited about that because there is nothing like finding a good staple piece for your wardrobe. On that note the design is beautiful and timeless and I fully intend on wearing this parka even when Ophelia is beyond the baby wearing years. The Cascades Parka is fleece lined, water proof, and designed for hiking/adventuring. It is also wind resistant and most importantly machine washable... because I don't have time for dry cleaning and you probably don't either. This jacket is soft, warm, and if you are out and about in Colorado at all this winter you will most definitely see me wearing it. When I am not baby wearing I found a coat that actually works equally well and is a lot slimmer than the parka. it is the Grandview Shell and is my next winter essential... this shell is long similar to the parka but does not have a hood and is a lot less bulky. I am not positive it is quite as warm as the parka but is really great for layering and super light weight is I pretty much have have worn it on top of everything and it has worked great! The Grandview shell is designed for adventure and actually I think would roll up super small which makes it great for travel as well. It held up great in the cold and wind when we took Jessamyn to ride a pony for her birthday and like I said is also really easy to use for layering. I have it in black but is also comes in a blue color as well and I am convinced would go with just about anything. The last item I want to share with you is the layer I used for layering under well just about everything! The Stowe Hoodie 2.0 is amazing.. I used it while we were out hiking but also frequently use it while running and even just going out for errands. This hoodie is super light but also incredibly warm which makes it great for layering. The hoodie comes in several colors, I have it in black and white and love the neutral base it brings to just about any outfit. The Stowe Hoodie 2.0 is also pretty great because unlike a normal hoodie it has a bit of a higher neck which creates a prettier look but also practically helps keep your neck warm and protect against the elements. Basically this hoodie is just a great neutral and something I will quite literally use until it is worn through... which will take a while because again like the parka and the shell they are incredibly well made. Okay! SO those are my winter essentials... like I said before you will most definitely catch me in them if you are out and about in Colorado. If you have any questions about Athleta please comment below. 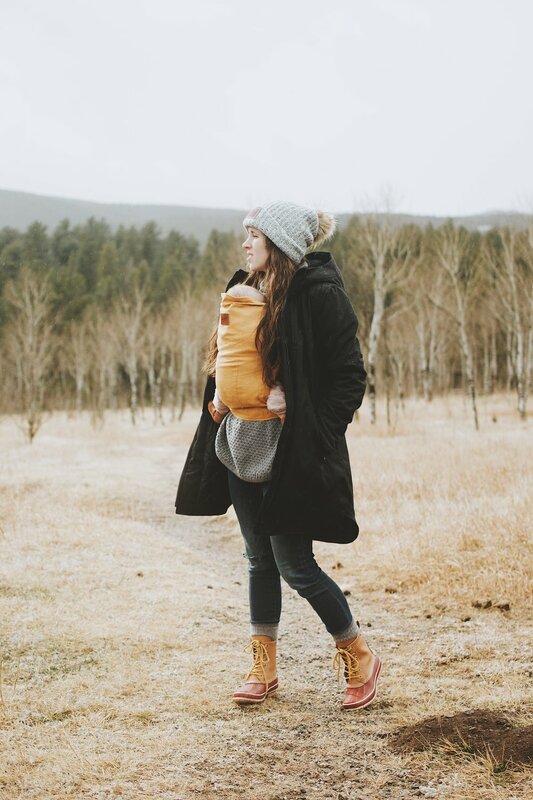 If you have any of your own winter essentials or tips for baby wearing in the winter I would love to hear them!